You know when you’ve made something you just love, can’t stop touching, and can’t wait to wear? 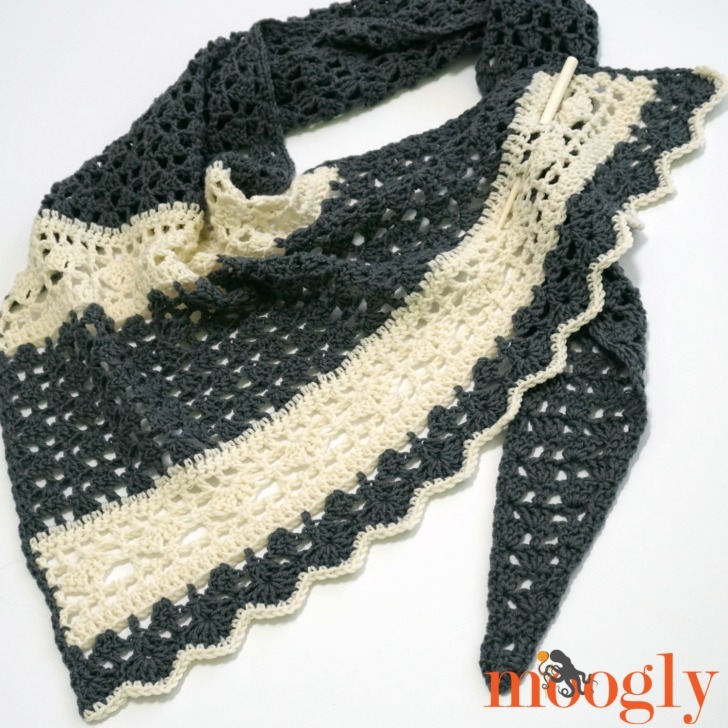 For me, that’s the Quicksilver Shawlette – a free crochet shawl pattern here on Moogly! 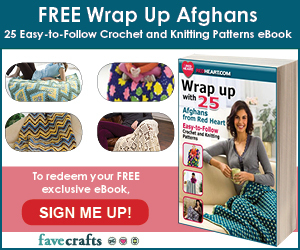 Disclaimer: This post includes affiliate links; materials provided by Lion Brand Yarn. The Quicksilver Shawlette is, to date, my favorite piece. 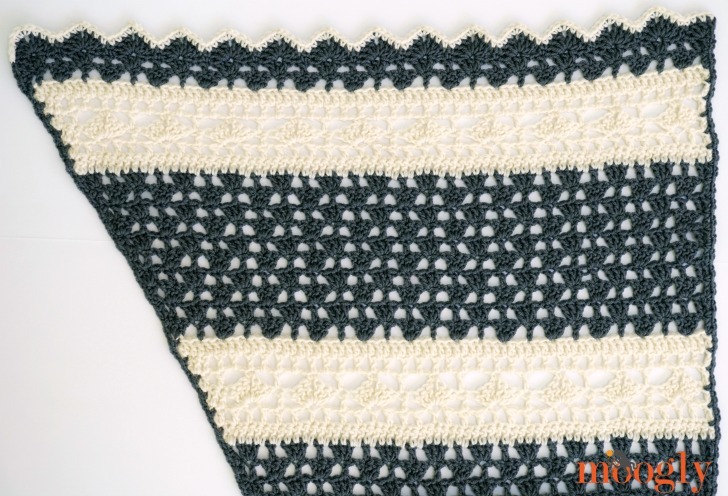 I love the neutrals, the interplay of the stitch patterns, the edging – all of it. And it uses (less than) 2 balls of yarn – and takes only a few evenings to make! 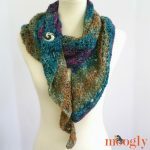 And I’m so excited to share this finished pattern with you! It’s interesting, while still being a great Netflix pattern – and I can’t wait to wear it out. It is the perfect blend of feminine and graphic, ready for date night, school runs, and coffee with friends, jeans, leggings, dresses, fall, and winter! I used LB Collection Superwash Merino, and love the combination of Charcoal and Ivory. But this pattern would be amazing with other color combos too. Imagine a bright pink Dahlia instead of the Ivory, or go tone on tone with Eggplant and Wild Berry – so many possibilities! 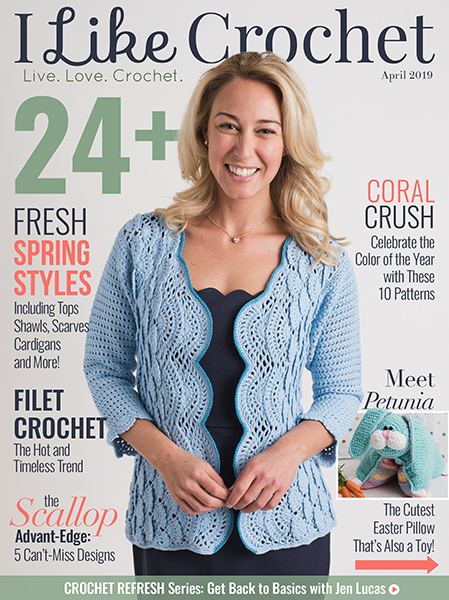 Note: This pattern uses only basic stitches – chains, single crochet, and double crochet – except for the CSDC. 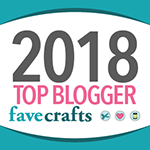 If preferred, substitute a ch-3 for the CSDC, or a ch-2 and dc in the first st – whichever method you like best to begin a row of double crochet! Row 13 – 63: Repeat Rows 7 – 12 (stitch count will increase by 1 per row), ending on a Row 9 repeat. Break Color A. Row 71 -79: Repeat Rows 11 and 12, then Rows 7 – 12, then Row 7 again, break Color A. Row 80 – 85: Repeat Rows 64-69. Row 87: Repeat Row 9, but do not turn at the end of the row. Edging Round 1: Turn shawlette 90 degrees to work along the longest edge, *ch 2, sc in top of next row; rep from * to corner; work 2 more sc in corner; rep from * across second longest edge to corner; CSDC in the first st of the previous row, 3 dc in the same st, ^skip the next dc, sc in the next dc,^^ skip the next dc, (3 dc, ch 2, 3 dc) in the next dc; rep from ^ across previous row finishing last rep at ^^; join to first ch-2 of edging and break yarn. Edging Row 2: With Color B, join with sc in top of CSDC of Edging Round 1, sc in next 3 sts, *skip the next sc, sc in the next 3 sts, (sc, ch 1, sc) in the next ch-2 sp, sc in the next 3 sts; rep from * across, sc in the last st, break yarn. Weave in all ends and block lightly to dimensions given. The Special Section can only begin after a row that has a stitch count that is a multiple of 8 – like Row 63 (which has 64 sts – 8×8) and Row 79 (which has 80 sts – 10×8). 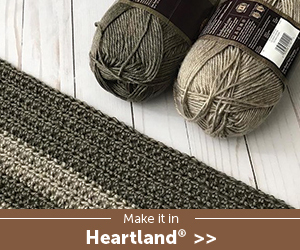 After a Special Section, begin again with the Repeated Row that would usually come after that last Repeated Row you made before the Special Section. For instance, Row 63 is a Row 9 repeat, so after working the Special Section, we begin again with Color A in Row 70 with a Row 10 repeat. Row 79 is a Row 7 repeat, so after that Special Section, Row 86 is a Row 8 repeat. You may need to end the last section of Edging Round 1 in a different place, depending on how many stitches are in the previous Row – if you don’t “land” with a sc, work a half shell to match the other end – aka 4 dc sts. And that’s it! 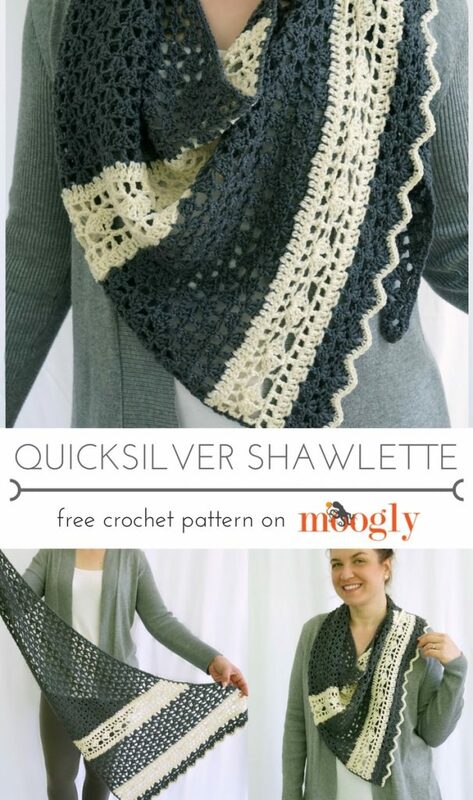 I hope you enjoy making the Quicksilver Shawlette your own. 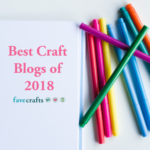 Please do share your photos on social media with me – on the Moogly Facebook page or @mooglyblog on Instagram or Twitter – I love seeing what you’ve made! This may be my favorite of all your shawls and shawlettes. 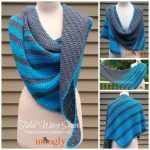 I love the mix of stitches that add interest, and I love this particular color combo, although it would be beautiful in just about any color duo. It’s simple elegance! Thank you so much for sharing the pattern. I’m choosing my colors now. Thank you so much Judy! ♥ I’m so glad you like it! Another homerun Tamara!! 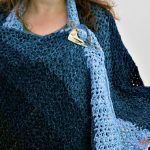 I’ve been searching for a crochet shawlette pattern and yours is so pretty!! Hi is there a chart? I just can’t get it, I don’t know why, by the comments, i can tell it’s me….It’s lovely, I’d like to make it. I too would benefit to a video! This is my favorite pattern of your. Well done it is gorgeous. Maybe I’m reading the pattern wrong. On row 70, if you are only skipping 1 dc, but do 3 dc every other dc, you will end up with more than 71 stitches at the end. I’m making the shawlette a little larger (added 8 extra rows) and I’ll have 119 stitches after row 70. My row 69 had 78 stitches. My apologies, there were two numbers missing from that row instruction – it’s been fixed now! I came looking for info on row 70 as well! 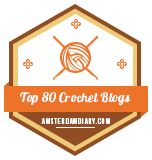 I have way too many stitches – it seems 6 for every 4 in the previous row? Oh good, you’ve fixed Row 86 too 🙂 Ta! I’m a starter and I would like to do this shawlette in pink and purple for my ten year old daughter. 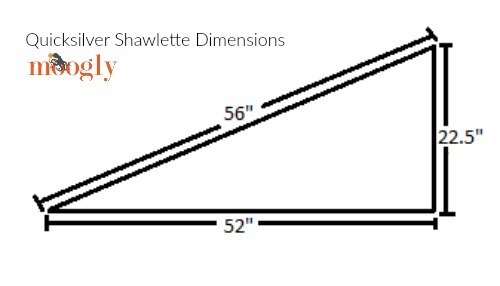 But I have no idea of the proper dimensions. Could you help me? I love this pattern! 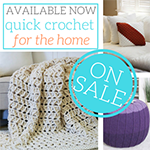 I’m making my second one and although I’ve been crocheting a while I have a sort of beginner’s question. I am TERRIBLE at doing the single crochet border all the way around a project. It never looks as neat as yours – and it probably never will – ha! But perhaps I can come closer if I can figure out how many single crochets to use per double crochet as I’m going down the side. Is it two? Or just one? Hello! 😀 I think a good rule of thumb is 2 sts per dc row. 🙂 And don’t be afraid to put one of them where the rows meet – the space is ready and waiting there! Looking forward to the charted pattern. Hello,my name is Núria. This pattern is amazing!!!! Loving it!!! Sorry, I’m Spanish and there are points in English that I have not yet mastered. Hthe CSDC points ???. Another winner! This one is stunning! Thank you so much for this beautiful pattern! I’m making one for my grandmother-in-law. I do have a question, on the second Color A section after the special section, there are 9 rows listed (11-12, 7-12, 7) but it looks like there are 10 in your sample. This makes the second special section starting on the wrong side (straight side). If I’m doing this correctly, should there be another row? If so, which row? I think I’ll do another row 8. Thanks! Never mind! I realized I missed row 70. Time to rip some out! Never mind! I figured out I skipped row 70. Time to rip some out! I would be happy to pay a little for this in a truly printer friendly version. I started printing and saw it was going to print all 42 comments!!! that is not printer friendly. Please advise. went to the website for print friendly and it worked… For some reason just clicking on ‘printer friendly’ did not work.. might be my firefox browser. Hi, I love this pattern but have some difficulties understanding the instructions. What do you mean by repeated rows (rows 7-12)- do I have to make every raw twice? Hi Michal, and thank you! That is there in the instructions to set aside the stitch repeat so it’s easier to read. If you read further in the pattern, you’ll see “Row 13 – 63: Repeat Rows 7 – 12” 🙂 So you repeat Rows 7-12, in order, over and over again, until you have 63 total rows made in the shawl.